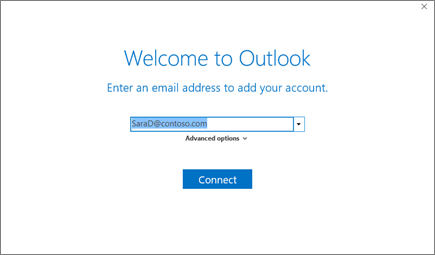 If you haven't launched Outlook before, you'll see a welcome screen. Enter your email address and select Connect. If your screen looks different, enter your name, email address, and password, and select Next. If prompted, enter your password and select OK. Need help? See Troubleshooting Outlook email setup.